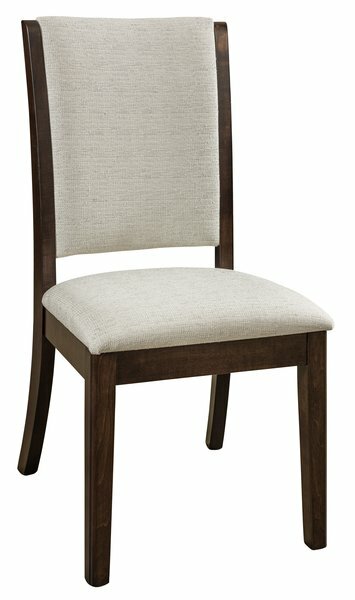 The Amish Sherita Upholstered Dining Chair has a lot to offer in your dining room or kitchen. There's the versatility of this transitional style dining chair that combines traditional with contemporary for a look that works. There's the comfort of a well made chair using solid wood and quality custom upholstery. And there's the richness and durability that you can count on from Amish furniture that guarantees you're getting your money's worth every time. Sherita's seat and back are fully cushioned for comfort with legs of modest thickness that curve gently outward in back. These dining chairs can looked dressed up for more formal occasions or are casual enough for every day. The Sherita is shown here in brown maple wood with coco stain. Our dining chairs are made to provide durability in styles you love. Shop online or feel free to work with a Furniture Specialist. We can be reached by email or toll-free. Thanks for visiting us today. Shown in Brown Maple with C8-57 Co Co stain. Seats shown in Briar fabric.